The idea of the application is very simple and the way to use it even more : To manage your medication just by tapping your medicines with the smartphone and listening to them. Do you forget to take your pills? Have you ever mistaken a relative's medication? Are you scared to take the medicine again? Do you write on your pill boxes the doses and schedules? With WhatPills you will forget these problems. 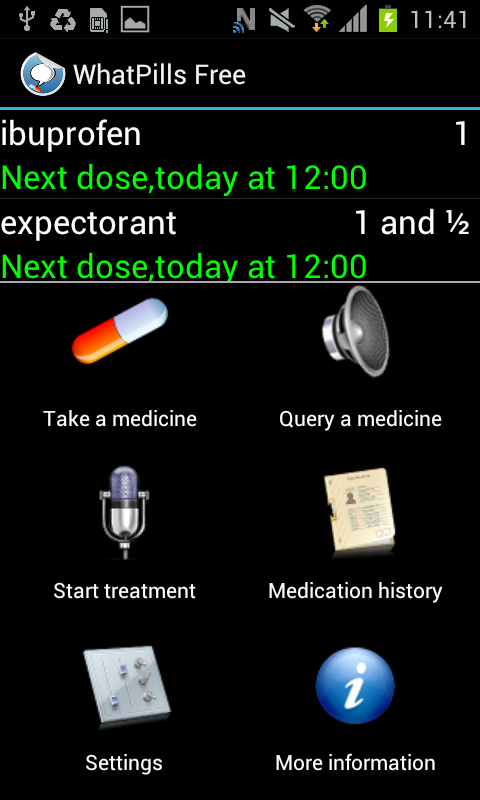 The app is intended to help you to follow right medication habits, avoiding medication mistakes. It is designed to be used for your grandma and has been tested by senior users. 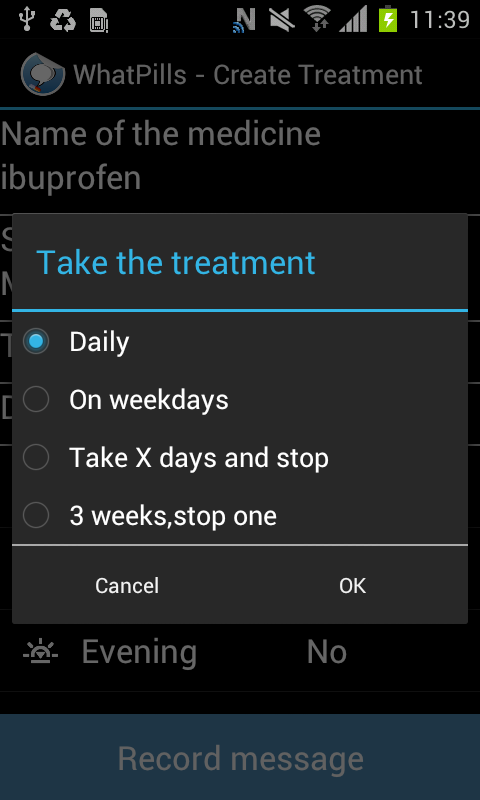 To create a treatment select “Record” to configure your treatment. Then tap the sticker with your phone and speak to the phone to record a linked message. A short and encouraging message from a relative usually works very well !! 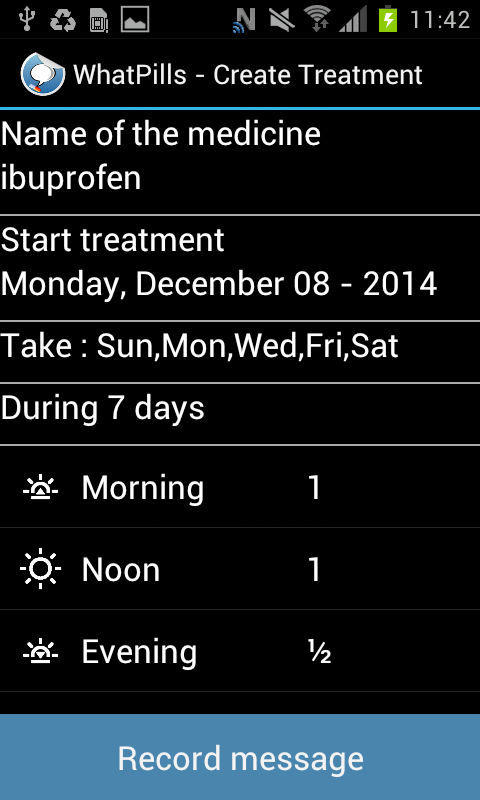 In the main screen you can see the next dose of each medicine to take. Green color means you are in time to take the medicine, yellow color means you are up to 30 minutes late, red color means you are more than 30 minutes late to take your dose. Select “Take” each time you take your medication. The phone will show you the dose to take. Select the medicine or tap the sticker to update the time you take the medication. If you mistake the medicine,the app will warn you. When you forget if you have already taken your medication, the next dose or any other information about the treatment, select the medicine in "Play" option or tap the sticker and the phone will speak aloud the information about the treatment. When the treatment is over just remove the tag. You can reuse it again and again. Would you do this with your phone? Get your free version !